Oct - 04 | By: Oregon Film | no comments. 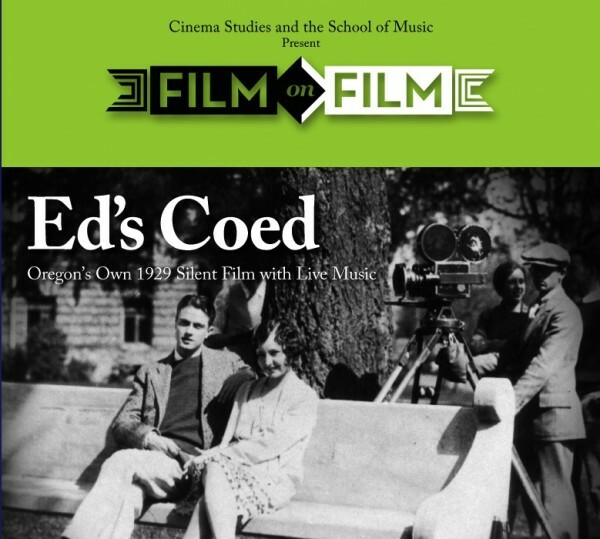 Eugene, Ore. – (Oct. 8, 2012) – The Cinema Studies Department at the University of Oregon, in conjunction with the Working Filmmaker Series workshop, will present the 1929 Oregon film “Ed’s Co-ed” as the first screening in this year’s Film on Film series. Showings of the movie are at 7 p.m on Friday, Oct. 12 and Saturday, Oct. 13. in Room 180 PLC. The screenings are free. The Film on Film project held several showings earlier this year and was created to show classic films in the 16mm format in large campus venues to bring back the film-going culture on campus. For this premiere, UO Associate Professor of Music Brian McWhorter has composed and arranged an original score for the film that will be performed live at the event by musical ensemble Beta Collide. The collaboration of the Film on Film Series and the original musical composition by McWhorter came about when Cinema Studies Director Michael Aronson, who had seen the movie and knew he wanted to show it to students, asked a friend in the music department if anyone might be interested in composing for the film. McWhorter was recommended as someone “always up for a musical challenge.” In the 1990s, when he was an undergraduate, McWhorter formed a group called After Quartet that performed original compositions to many silent movies, including his senior composition for “Metropolis,” which he performed in 1997, also in 180 PLC. Joining McWhorter in the rendition of Beta Collide that will perform the “Ed’s Co-ed” score are some of the original members of After Quartet and some new additions. The group consists of McWhorter on period cornet; Lisa McWhorter on violin, patterning her playing after violinist Ed in the movie; Aaron Trent on drums; Kyle Sanna on guitar; Michael Ward-Bergmann on accordion; and Tyler Abbott on bass. “You can find old movie reels that come with a list of songs – music that everyone would have known at the time, along with cues for where the orchestra should play them during the film,” says McWhorter. Those were not orchestras in the traditional sense, he says, but more ragtime bands. Aronson is hoping to get a restored digital version of the movie for the university’s use, along with a recorded score of Beta Collide’s performance. Bitten with the film bug, Carvel decided to come back to campus and make his own film, working with fellow students and a journalism professor, and raising funds locally to finance the film. Nelson and his co-director, James Raley, were bold enough to approach Cecil B. DeMille for advice. DeMille put them in touch with James McBride, a Hollywood cameraman who joined the production as technical director. With a 35mm Bell & Howell camera rented from Hollywood, and a cast recruited from across the university, “Ed’s Co-ed” went into production in February 1929 and had its premiere locally in November of that year. There is not a trace of amateurism in “Ed’s Co-ed.” A typical college movie – with intrigue, romance and triumph – it is a treasure trove of period attitudes, codes, fashions and language. Cameos include appearances by Bill Hayward on the track field, shooting his pistol for the track team to take off, and former Dean Straub. “It holds up to professional work,” says Aronson. McWhorter will give the first talk in the Working Filmmaker Series from 4 p.m. to 5 p.m. on Wednesday, Oct. 10, in the Collaboration Center, Room 122 of the Knight Library. In his talk, “Composing for Media,” McWhorter will discuss what it takes to make a living composing, as well as his process for making music for media. Note: The University of Oregon is equipped with an on-campus television studio with satellite uplink capacity, and a radio studio with an ISDN phone line for broadcast-quality radio interviews.